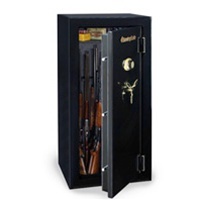 SentrySafe Fire-Safe, Security Gun Safes - ETL verified to manufacturer’s fire protection of 1400° F for ½ hour while the interior temperature remains below 350° F. Available in 14-gun, 24-gun and 36-gun capacities in either matte or gloss finish. You choose what best fits your needs. Adjustable shelf, 4 adjustable interior configuration options and bolt-down hardware providing the kind of innovation you would expect from the worldwide leader of safe and security products..
Capacity: 14.9 cu. ft. 0 cu. in. Ship Weight: 456 lb. 206.8 kg.